Emily (the newbie vegan) here. I know most of you are not residents of the snowy, modestly sized city in upstate New York known as Rochester, but if you’re ever in town, every vegan should make a trip to The Owl House. Although I’ve been there a handful of times (plus takeout orders), Thursday night was my first time there as a vegan. Even as a vegetarian, choosing an item off a restaurant menu is pretty straightforward. We’re usually given three choices at a traditional restaurant: a salad (no, I do not want the grilled chicken on top), a veggie burger (which I just know is often grilled on the same spot as someone else’s hamburger) or some kind of hummus appetizer. Although many restaurants have delicious veggie-friendly dishes, we quickly get used to our limited options. But when I visited The Owl House for the first time, I was completely overwhelmed. So. Many. Options. And they all sounded delicious. There’s the vegan Caesar salad with house-smoked tofu (which is now one of my favorites), the lentil burger with half sour pickles and avocado and the BLT with fakin’ bacon and garlic Veganaise. And don’t even get me started on the daily dinner and dessert specials. The restaurant also has a number of meat dishes, so vegans and meat-eaters can co-exist. On my most recent trip, I sat at the bar with a friend (who is not vegan or vegetarian, but appreciates the cuisine). The bartenders – more like mixologists – are just as awesome as the servers. They also have an extensive list of microbrews and original cocktails. Take the Grasshopper, for example: vodka, creme de menthe, rice milk (yay! ), chocolate bitters and housemade chocolate sauce. I ordered the vegan Caesar salad and a cup of their soup of the day, artichoke and chickpea. The salad is topped with vegan Parmesan cheese, sesame seeds, eggless dressing and smoked tofu. The soup, however, was uncharacteristically disappointing. Their soups are normally fantastic. I’ve had a pumpkin soup and a coconut curry soup that have knocked my socks off. I even ordered a second bowl of the coconut curry once (don’t judge me). For dessert it was the peanut butter cake with chocolate ganache frosting. All I can say is wow. The cake was heaven in every bite. It was one of those desserts you take teeny tiny bites because you never want to finish. I almost wish I’d ordered one all for myself (although my hips are thanking me now). 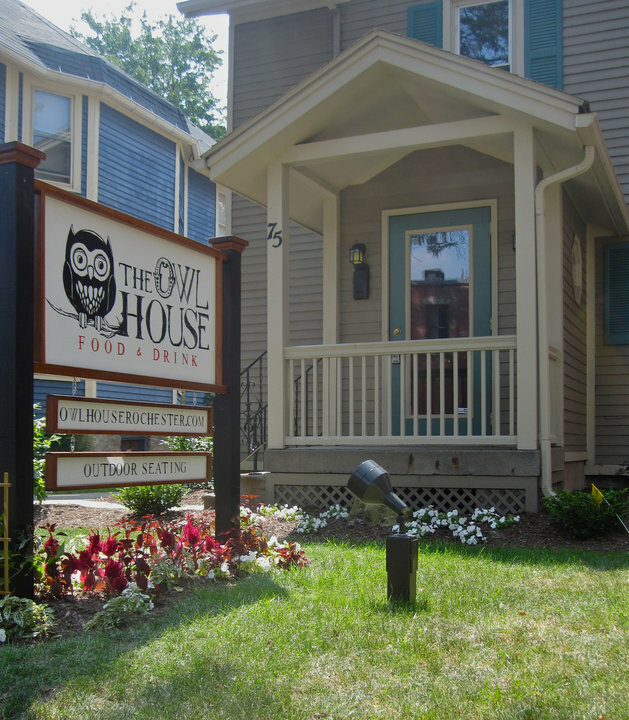 Be sure to eat at The Owl House if you’re in Rochester. What the city lacks in sunshine, we make up for in delicious food – including the legendary grocery store, Wegmans. Believe it or not I still have to try the vegan mozzarella sticks. I have a feeling I'm missing out. We keep saying we're going to take a trip to Rochester to introduce "Friand" to the family, so maybe when that happens we can pig out on all the cheese items I have been missing out on (including that brie dish!! ).Also, I feel stupid for having written "So exciting" instead of "so excited!" LOL!!! My family and I were very excited about dining at The Owl House last Feb. (Reservations strongly recommended). The ambiance is not typical of a health food or veg oriented restaurant: it’s hip and clean tavern like. Very comfortable. I did order the mozzarella sticks, and they were fantastic. We did find, on that February evening, that many of the vegan dishes were a little too liberal with the smokey seasoning for our tastes. We had a the vegan pot pie, and another tofu dish, that also made abundant use of the smoke. Thoughts?